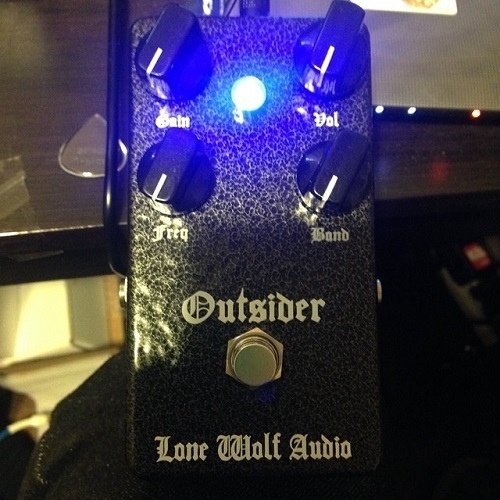 The Outsider is a modern updated take on the legendary and ultra rare Systech Harmonic Energizer. A parametric eq/fixed wah type effect that adds a throaty rasp to leads and chords. Utilized, and mastered by Zappa, this pedal has been tweaked and tuned to the highest detail. The Gain knob adds up to 35DB of transparent gain that when put in front, or after a distorted signal opens up a whole new range of tones. The Bandwith knob dictates how wide the Frequency knob can alter your signal for a brighter, thinner, yet thick and cutting tone, or a darker, fatter, yet cutting tone. Dimensions: 2.5" x 4.75" x 1.5"